Everyone looks great in Pink. Show off your support for a loved one by proudly wearing your Personalized T-shirt for Breast Cancer Awareness all over town. 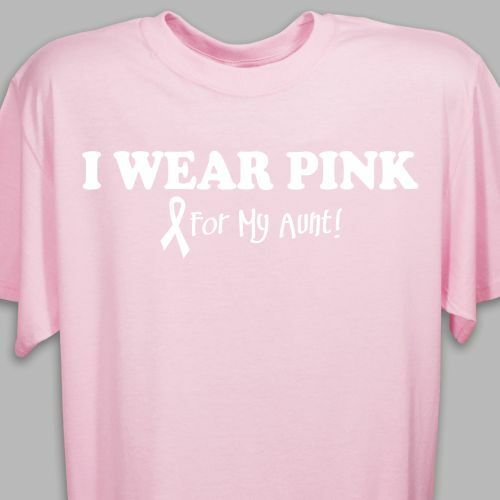 Our I Wear Pink - Breast Cancer Awareness Personalized T-shirt is available on our premium pink 100% cotton T-shirt, machine washable in adult sizes S-3XL and youth sizes S-XL. Includes FREE Personalization! Personalized your T-shrit with any title. it shows that you can get it in black lettering and that is what i picked but when it arrived it was white and they wouldn't let me return it.